After a day of rest (which turned out, again, to be rather pointless) we departed the strange French club resort in Chorges for the Ubaye valley. Today we had to climb 2 passes, first – Col Lebraut, 1120m second, unnamed pass near St. Laurent. The first climb began straight out of the hotel’s door, from 840 to 1120 meters. It took us about 45 minutes to get up the pass. It’s quite hot now in the alps, get’s up to 31C in the day time. We wanted to start early, but ended up leaving at 10am. A fast descent brought us to the shores of the Serre-Poncon lake. One of the largest man-made lakes in Europe was created by installing a dam into the mouth of the Dorance and Ubaye rivers to protect Gap valley for devastating floods. The lake fits perfectly into the mountainous terrain of the area. However, since the valley is flooded, the roads around the lake are quite hilly (not following the valley floor, but jumping over the ridges that go down to what used to be the valley). We descended through a short tunnel past the dam to around 600 meters and started out second climb of the day. 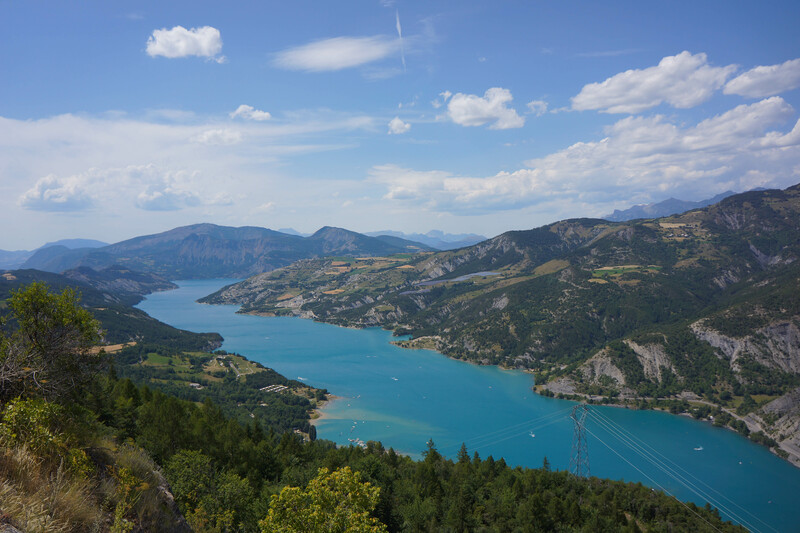 The South side of Serre-Concon lake belongs to department of Alpes du Haute-Provance, we are getting closer to the coast! The second climb was long, not too steep, but in the heat it really wore me out. Even above 1000 meters it was still very very hot. Dianna’s Chariot was heating up as well and that started bothering her. At one point I forgot to take it off the parking brake and cycled around 1km up a 6% hill with that on. About 2 hours later we were at the top of the climb, at 1120 meters enjoying a marvelous view of the Serre-Poncon lake and the Ubaye valley. Tomorrow we will head for Barcelonette, a large town at the end of the Ubaye valley. From there we will start ascent of the Col de Coyolle.